GLENCOE, MN – Tom Pinske, of The Pinske Edge, Inc., countertop fabrication industry supplier, was recently honored by the Glencoe Area Chamber of Commerce as the 2013 Manufacturer of the Year. 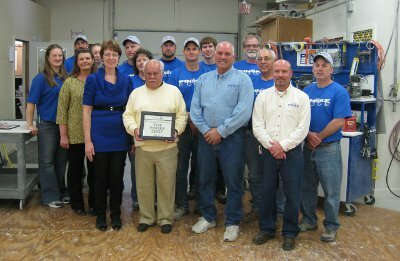 The Pinske Edge Named Manufacturer of the Year In recognition of this award, an open-house was held for fellow chamber members and the community. The Minnesota Dept of Employment and Economic Development (DEED) was on hand to speak to the attendees on the importance of manufacturing in Minnesota. According to the presentation, 22% of the total jobs in southwestern Minnesota are in the manufacturing field.